Heather has written in with a question that expresses a confusion or uncertainty that bothers many people who are interested in Astrology. Rob Tillett, leading astrologer and founder of Astrology on the Web, responds with a brief explanation of the way the signs, planets and other factors interact to form the whole person. Heather writes: "Hello, I noticed on your site that you state the sun sign as being our "inner nature". It has always been my thought and in all books that I read that the moon sign is your inner nature and the sun sign in the outward demeanour and then the rising sign is your character. If I am misunderstanding this, let me know... However, I don't see anything about the moon signs on your site either. The moon sign is really a great part of astrology. Could you add it? Sorry to pick apart, hope all is well!" Rob answers:Hi Heather and thanks for your thoughtful note. The Rising Sign or Ascendant governs the appearance and the self-image, which in conjunction with the Moon and ruling planet expresses the way others see you, and indeed (especially the Moon) tends to be the way you see yourself. 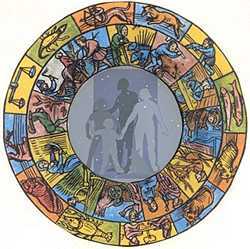 The Ascendant or Rising Sign is the sign rising over the horizon at the moment of your birth. The Earth rotates once on her axis every twenty-four hours, so taking just one day to have all of the signs from Aries to Pisces rise over the horizon. Each sign takes about two hours to pass across the horizon, so the time of birth is quite critical in calculating the Ascendant. You can calculate your own Ascendant with our new Rising Sign Wizard, free of charge on this site. We do not have a Moon Sign directory on our site, because the Moon changes signs so frequently that the vast majority of people have no idea what their Moon Sign is. I suppose we could place a Moon Sign table on line, but it would be hard for most people to follow, because it requires complex calculation (which you would usually seek from an astrologer) to determine the true position of the Moon at your birth. We have however now placed a free on-line Birth Chart Wizard, which will calculate your rising sign and Moon sign if you know your time of birth, along with all the other planets and points. The same goes for the Rising Sign, but we now also have a free on-line Rising Sign wizard whereby anyone who has the correct birth time can calculate their rising sign, with a brief interpretation. If you know your Moon Sign, the Sun Sign descriptions on our site will fit well enough, but you should definitely get a proper, personalised interpretation for full details. I trust this has helped to clarify matters. You can get a better grasp of what the symbols mean by checking out more of the articles on this website, especially starting with our Introduction to Astrology and Relationships and following the links. There are some wonderful articles by great writers here on Astrology on the Web, so you might like to check out our Feature Articles, or our Site Map. Questions of this type are perhaps best addressed through our Forum, which is accessible via the link at the bottom of just about every page on the site. It's a sort of Question and Answer system, which is open to the public and anyone can contribute both questions and answers.